This part number is just a little tricky. The first Funnels were manufactured between 1914 and 1918, but were given the part number 64. They appeared in outfits from 1914 and 1915 only, and then disappeared. 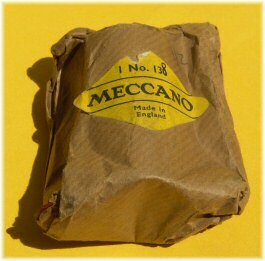 They were, of course, the first coloured parts ever to appear in a Meccano outfit. In 1922 a new vertical part 138 arrived, but only in the largest outfit 7. Then in 1927 the new part 138a "Ship's Funnel, Raked" appeared in red and black with a steampipe and was put into outfit 7 in place of part 138. The vertical Ship's Funnel part 138 continued to be available, though. In 1929 Meccano had something of a fit and replaced part 138a with a whole series of 26 Ship's Funnels painted in different colour schemes of major shipping companies, numbered 138a to 138z. 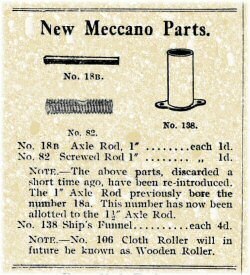 The new parts were mentioned in the June 1929 issue in a reply to a reader. Part 138 continued to be vertical, and cheaper than these newcomers. It wasn't until 1953 that Ship's Funnels reappeared, this time only one version. The post-war Ship's Funnel is raked but has no steam pipe, and it is number 138. There is no post-war part 138a. It went through colour changes but failed to appear in the 1978 new parts list. So, really, it's not too hard to remember. Part 138 has been available pretty much the whole time, without a steam pipe. Part 138a was on its own with a steam pipe for just two years, then was replaced by the set of 26 that lasted from 1929 through to around 1940. In the 1941 price list parts 138 and 138a still appear, but parts 138b-z have disappeared. Meccano made themselves a display cabinet showing just 25 of the special funnels (missing out 138i in order to make a display of 5x5 funnels). This was apparently rescued from a skip outside Binns Road, which is just as well as there are very few original funnels in this condition around. 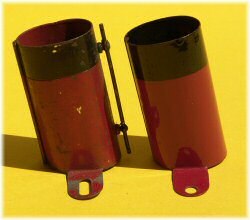 The first type of Funnel (part 64), manufactured only between 1914 and 1918 and only supplied in outfits for the first two years of that time, was a simple sheet of red painted tinplate. 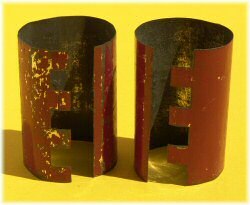 It was formed into a cylinder and the 'teeth' on one end were interlocked with the opposite plain end. The idea was to wrap it around a 1" pulley in order to fix it to a model. In the process of manufacture, it appears that two versions of this were made – one with three teeth and one with four. 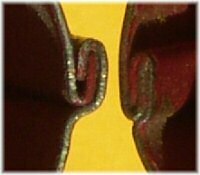 It looks at first sight as if one is made from the offcut of the other, although the pair in this picture aren't a perfect pair. The reintroduced Ship's Funnel (part 138) in 1922 was vertical and had a base with two Meccano holes into which the cylinder was fixed. The underside is clearly shown in this photograph. 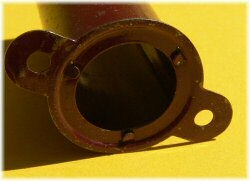 This part had a nickel plated base and the outside of the funnel was painted a light red. In 1927 the funnel became entirely dark red, painted inside and out. By 1932-33 the dark red lightens up to a variety of mid-red shades, but these are all painted throughout which makes them easily distinguished from the pre-1927 versions. 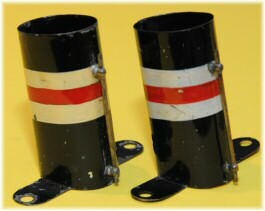 Early vertical funnels (red/nickel and dark red) are found with both Meccano and MFEA stampings, but the all-red versions are only stamped Meccano. Confirmation of these funnels can be found in these pictures of the early Outfit 7 and Outfit 6a. The new part 138a "Ship's Funnel, Raked" appeared in 1927 as shown in the left-hand example here. The steam pipe is painted black, along with the top of the funnel. Note that the flanges at the bottom have elongated holes. In 1929, part 138a became part of the set of 138a-z. There were, however, a few more changes than that. The flanges now have round holes, and the steam pipe was shortened and painted gold. Note that part 138a was taken by the Cunard line colours (similar to these examples, but with three additional fine black lines around the funnel as in the example at the top of this page). The funnel shown in this picture is actually a part 138h from the Great Western Railway. This serves to see whether you're still awake. Another change that happened at the same time is the redesign of the seam. In the vertical funnel and the early part 138a (from 1927-29) the seam is clearly on the outside of the oval funnel. In the series 138a-z and all later funnels, the seam is folded on the 'inside' such that the outer oval is smooth. There is sometimes some confusion over the number of Funnels that were made. There were twenty-six raked funnels, from 138a to 138z. Plus the standard straight funnel part 138. There is a famous picture in Volume 6 showing just 25 of the raked funnels (in order to fit into a 5x5 frame), which is missing part 138i. 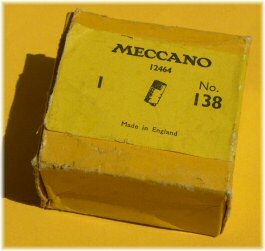 On the other hand, Meccano was confused, too, describing 24, 25, and 26 variations in different parts and price lists over the period. In the final November 1941 parts price list only 138 and 138a are still shown, and the remaining special funnels 138b-z have disappeared. The Ship's Funnel was reintroduced in 1953, as part number 138. The funnel was raked, but had no steam pipe. 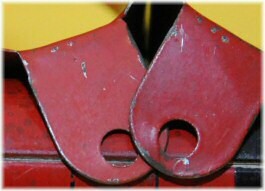 It was initially supplied in red with a black top, which is why it is often confused with the earlier 1927-29 part 138a. The only remaining change is to a yellow funnel with black top, which was presumably in 1964 along with the rest of the colour changes. Since this was only ever supplied as a spare part we can't be absolutely certain about any dating from this point. The Ship's Funnel disappears from the parts listing in 1978. To the left, a very unusual plain dark yellow funnel. It's assumed that this was an experimental or pre-production part intended for 1978 but dropped before it went into full production. Even stranger, to the right is an example of a 1927-29 part 138a (elongated holes, outside seam, long steampipe) which is missing its steam pipe. Not too unusual, but this funnel has an third hole in it. Anyone know why? DMS/EMP mention a few other oddities, including a narrower diameter French pre-war vertical funnel, an all-red post-war funnel, and another post-war funnel with holes for the steampipe that have been filled and painted over. We have to be extremely careful about home-made and home-painted versions of these parts as there are a great number around. One of the best examples of this is the picture to the left (click on it to enlarge). This is a beautiful mock-up of the genuine funnel display cabinet shown above, with some more invented variations added to make a total of 36 different funnels. The display was shown by Roy Whitehouse at Skegex in 2005, and this photograph is by Jonathan Shapero of the NMMG. Roy painted the funnels from a photograph of Jim Gamble's display, adding further funnels from other shipping lines. Watch out for the obvious inconsistencies, though. The steampipes on these funnels are all gold (as they should be), but many are the full length of the funnel, as with the 1927-29 part 138a. The examples of 138i and 138y, for example, are repainted 138a's, but the 138d looks right. Others such as the 138t and 138j have replacement steampipes of the full length. All genuine 29-41 lettered funnels should have shorter steampipes, and consistent support positions. In addition, Roy's quality painting and masking gives these away as reproductions. The genuine Meccano articles aren't nearly as well finished. Different white shades, possibly varnished and yellowed? The special coloured funnels have some colour variation here and there. 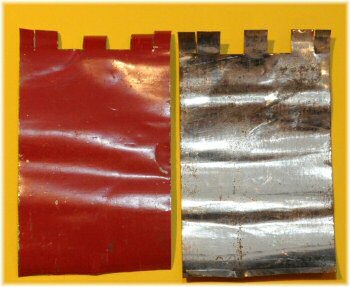 Above are two examples of part 138c, where one appears to have been overpainted with a clear varnish that's yellowed slightly. To the left are three different red funnels, where we can see all sorts of shade variations. We can't consider these different funnels. To the right, however, is a much rarer beast. 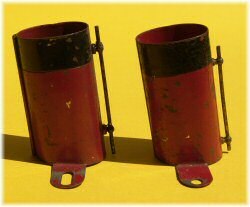 This pair of funnels was found in a late 1913 outfit in very respectable condition with 1914 contents. Tim believes this is a very early version of the part 64 funnel before it was realised that a pair could be made with one stamping, but I suppose we should wait to see another example before assigning it a "proper" part number. Above are two examples of the post-war Ship's Funnel, part 138. The left-hand example is wrapped in brown paper with a rounded yellow diamond, typical of 1951-53ish. Note that the label says "1 No. 130" and the 0 has been changed to an 8. To the right is a later boxed example. Black/white/thin black/red, London & N.Eastern Rly Co.
¹ It's assumed that part 138 could have been special-ordered in nickel from 1927 to 1941, but we haven't yet seen one. We'd love to see more pictures, and very many of these pictures and examples aren't good quality anyway. If you have one of these (or can take a better picture), please do so in as much light as possible and send it! Total number of messages on this page: 17. This is page 2 of 3. 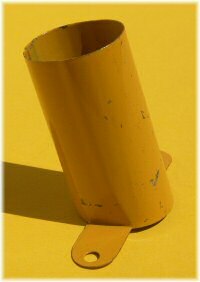 I have just acquired a Ship's Funnel, raked with steampipe in a very mixed lot of Meccano. It has a black top, a white band (about half the width of the black top), a thin black line, and then red with two black lines. The steampipe may have been gold or brass coloured. Possible matches are 138d and 138m. 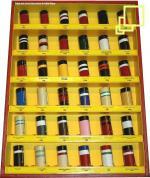 In DMS, these differ only in the width of the white band, but the display cabinet shows a black line under the white band on 138m. Neither have the other black lines. 138d is identified as being the United States Line funnel but pictures of the ships show a narrower white band. 138m is identified as an LNER funnel. Pictures of their ships show no black lines. I will put a photo in the gallery soon. Hi Pauli - could you please post up a picture of the 5-tooth funnels that you have found? 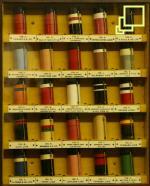 Perhaps start a new thread on the collectors forum? Also, some of your other variations of the 138 series would be interesting to see in more detail as well please. I won the auction for the funnel I mentioned with the black steam pipe and it arrived today. Under close inspection with good light, it certainly doesn't look like there has been any repainting. Another variation is confirmed. Looks like the 138h except the steam pipe is black not gold. No obvious signs of being a repaint. I've two of the "much rarer" five toothed tinplate funnels mentioned at the end. Both are still round, rather than being flattened but it adds a lot of credence to this being a genuine Meccano part. Time for a part number for it? I've just picked up a red raked funnel with short steam pipe and round lug holes. No black top and no black stripes. It doesn't look like a repaint either. I'll get a photograph this weekend if the weather is friendly.